Climate change isn't just a matter of keeping the planet habitable for future generations or merely a topic for environmentalists. Climate change has very real health risks for individuals across the globe, which makes it bad for business and an important cause for employers to champion. The risks associated with more frequent heat waves are very real. According to Dr. George E. Luber, a medical anthropologist and the former head of the Centers for Disease Control and Prevention’s Climate and Health Department, there are significant links between climate change and health problems like waterborne illnesses and heatstroke. According to a study published in The Lancet, there have been a marked increase in traditionally-tropical diseases, such as dengue fever, in non-tropical locales, such as the United States. The publication, which incorporates the work of 24 academic institutions and agencies of the United Nations, concludes that this increase is a direct result of global climate change. It goes on to state that heatstroke isn't the only potential health risk associated to rising temperatures. Heat stress, which comes with rising temperatures, can also lead to kidney and cardiovascular disease. Higher temperatures can also reduce a person's capacity to work, particularly in outdoor jobs, such as construction and agriculture. The Lancet study estimates that more than 153 billion hours of labor were lost worldwide in 2017 due to increased heat. That's an increase of 64 billion hours since 2000. Hardest hit were rural agricultural companies in countries like India. In 2017, 157 million more people were exposed to heat-related risks than in 2000, and those numbers were compiled prior to the "scorching summer of 2018." Most at risk are people in the United States and Western Europe, which are areas with large aging populations, because people age 65 and older have an increased risk for heat-related illnesses. The researchers also expressed concern that the world infrastructure, such as aging sewer and water systems, could be overrun by increasing rains, causing them to overflow and create a breeding ground for mosquitoes carrying diseases from yellow fever to Zika. World food production may also be affected by global climate change if the current trend continues. The report notes that while the earth is still able to feed itself, crop yields are diminishing in 30 countries and the quality of the food produced could be adversely affected as increased levels of carbon dioxide reduces the nutrients in crops and seafood. Fortunately, there are a number of things that employers can do to slow or reverse the trend of global climate change. Many of these changes can even help their bottom line. Choosing materials that are sustainable and don't contribute to the destruction of world resources is something that all companies can do, regardless of industry. This means opting for recycled products when available and choosing raw materials that are easily regrown, such as bamboo over traditional hardwood. No employer can address climate change alone, which is why combating climate change requires a global effort. Make sure that employees are on board with the new sustainable living agenda. Since many of these changes will also save money and promote health, employers might consider offering incentives for something like biking to work or recycling. 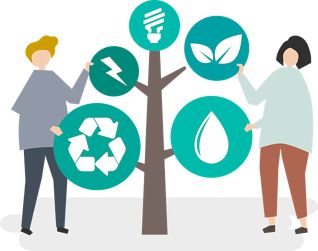 They might also host a company "green day" where employees plant trees or clean up a park or run a "Sustainability Challenge" where employees learn and practice sustainable habits as a part of the company's greater wellness program. Making operations more sustainable includes large projects like replacing machinery and systems with energy-efficient models and small investments like swapping out old light bulbs with new LED lights. Look for ways the business operation can use less fuel and thus produce fewer greenhouse gases. Many of these initiatives require upfront investments but generate positive returns in the long-run, making them attractive business decisions. Creating new products from scratch requires much more fuel than creating products from recycled materials. Plus, recycling reduces the amount of material in the world's landfills, another source of greenhouse gases. To promote recycling at the workplace, make it is easy to do by having clearly labeled recycling bins throughout the office or facility. It's clear from various reports that global climate change isn't something that's happening far away. It's affecting the food supplies and health of people across the globe, and no employer is immune to the impact of climate change. 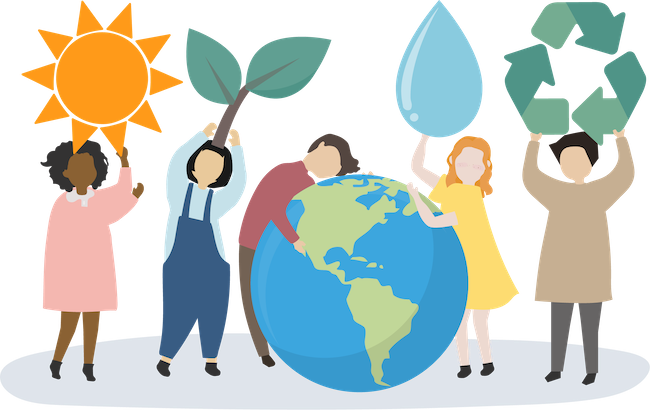 Keeping employees and business profits healthy in the years to come will require employers to make a strong effort to combat climate change. 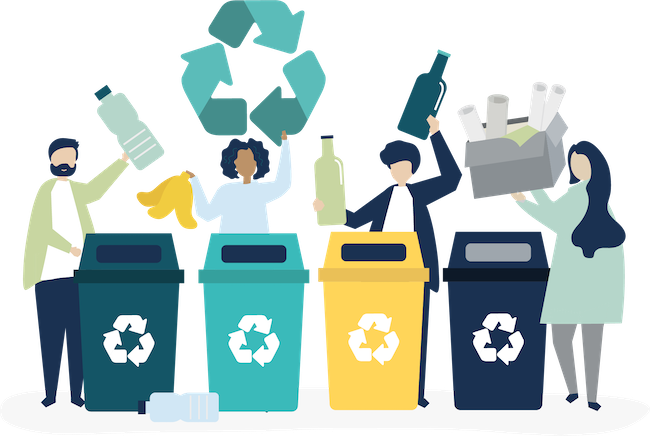 It's okay to start out with small initiatives, such as recycling and choosing materials or vendors that are sustainable, but real change requires a cohesive strategy, including one that gets employees involved in the movement.